Finally finished my entry for MTM: Falling Into Fall! A quick (and quite rushed) wall, TBH. (@__@) This time, I'm back with another Kunie Kanbara artwork! I was kinda weighing it out whether I should do a Kanbara or a Nakamura one----but Kunie definitely won me over. Unfortunately, the image that I used here isn't available in the scan gallery. I stumbled upon it on the KunieKai website. I stumbled upon it by chance 'cause the images change whenever you click on a new link and it's never the same image when you go back to that certain link. But I can assure you that I did get the image there. LOL. For the challenge, I used the color palette shown above. I chose that certain color palette because for some reason, the muted/faint colors describe what Fall is for me. I'm more of the Fall to Winter type of person. Haha. I guess that's about it. ^^v A comment AND/OR +FAVE AND/OR download would be most appreciated! that texture is sweet! 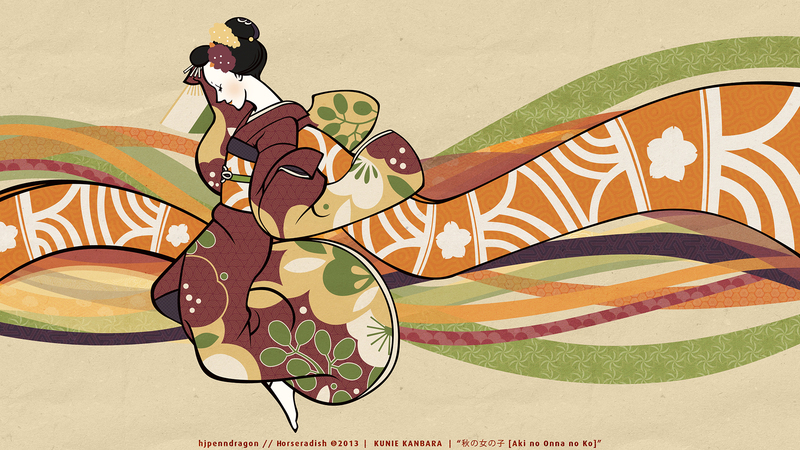 the bold black lines, the patterns....x.x nice use of the pallete! best of luck in the contest! I thought i have already posted a comen't here, well i guess not. Nice work with the colors, specially with the background. Keep it up. I love how you only gave the foreground line art, and not the textures in the background. It really gives it this depth you wouldn't expect! The textures are awesome her pose it sooo awesome. I love the overall composition and design of this wall, it gives me the feeling dynamism. Maybe because of the pose of the woman or maybe on how you've designed the background. Either way, exceptional choice of patterns and textures that really matches well with overall theme. As for the color palette, you've done it great here. There's harmony and balance between them. Plus the wide variety of available dimensions it offers. Great job!